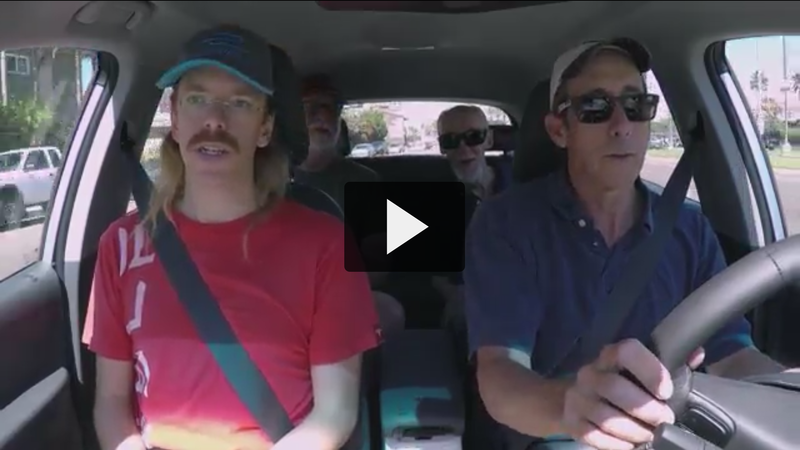 On a recent Saturday afternoon, Kim Reynolds from Motor Trend brought a Chevy Bolt to a Tesla meetup in Orange County, California, to see what a group of local Tesla owners thought about Chevy’s new entry into the market. This longtime EV driver was fortunate enough to be at the meetup, and I must say I was quite impressed. I’m predisposed to being impressed by any serious EV, but Chevy really does seem to have done a good job with this one. There are a lot of touches which show they put some thought into building this car as an EV. The car is obviously quick since it’s an EV, having more power than any non-Tesla EV I’ve been in, and the regenerative braking system is very strong. The car can come to a complete stop without having to touch the brake pedal – an odd experience for people who are driving EVs for a first time, but a much-desired characteristic for those of us who have experienced it. There are also paddles behind the wheel to choose the strength of the car’s regen, so drivers can experiment and find their favorite settings. Regen is a pretty common topic of discussion among EV drivers, so I’m glad that GM “gets it” and has offered regen which is both very strong and selectable. But the problem is that these selections don’t persist between driving sessions. Each time you get in the car, you need to select “L” mode if you want single-pedal driving (where lifting off the accelerator automatically decelerates the car, which is standard behavior in Teslas), and you need to press the paddles behind the wheel to pick heavier regen. This smacks a little bit of conventional automotive thinking to me – echoing “L” gear modes in automatic transmissions, or the Prius and its “B” drive mode. Apparently GM had several discussions over what to name this mode, and eventually concluded to stick with “L” (probably because they wanted to save 50 cents by not having to design a new shift knob…). Since the car will be capable of over-the-air updates, maybe they can add an option to have it remember your regen settings and automatically start in “L” mode if the driver so chooses. Though the car has no “frunk,” the rear cargo area is well-organized, with an extra compartment below the main cargo area to store your charging adapters for mobile charging, and an additional compartment below that for your “emergency” 120v plug, tow hook, and the other sorts of tools you like to have in your car but never really use. This compartment did look like it was originally designed to hold a spare tire and repurposed as cargo space, so I suppose GM wants to keep the platform flexible. The Bolt does come with Michelin self-sealing tires. The car does feel roomy. The battery pack is under the floor of the car, which helps handling and interior space, and there is plenty of headroom. I didn’t get to sit in the backseat 3-abreast, but it was plenty comfortable with four adults in the car. Perhaps the coolest feature was that the central rear-view mirror doubles as an LCD backup camera, just flip the switch on the bottom of the mirror and you’re given a nice wide view from license-plate-frame level (in the photo above, the trunk was open, so the camera was pointing to the sky). The car we saw was “premier” trim, so not all of these features will be present on a base “LT” model car. I’d like a few things from it. Because I’m a spoiled Tesla Roadster driver, I’d like it to have rear-wheel drive, and I’d like it to do 0-60 in 4-something seconds – although, again, it’s still very powerful, moreso than any non-Tesla EV I’ve been in. I’d really like to not have to select “L” mode for stronger regen every time I get into the car. And I suppose I’d like it to look sportier. But then, that’s why I drive a Roadster and not a hatchback. For those looking for an efficient and practical hatchback, this car ticks pretty much all of the boxes. Even though those of us at the meetup were spoiled Tesla owners, everyone seemed quite impressed. But despite the Bolt being labeled a “Model 3-killer,” the last thing Reynolds asked of us was to raise our hands if we had a Model 3 on order (almost all of us did), then to keep our hands raised if we would cancel our Model 3 order to get a Bolt instead (only one hand remained raised – a BMW i3 owner, who would consider canceling one of his two Model 3 orders and getting a Bolt and a Model 3 instead of two Teslas). This suggests that Chevy might find the Bolt a hard sell to current or prospective Tesla owners, and perhaps should focus on making new ground with ICE owners who haven’t been spoiled by the Tesla ownership experience yet. But that’s just the thing – we’re not in a zero sum game. Every new entrant into the EV space expands the market, they do not compete over a limited, never-increasing percentage of buyers. EV sales continue to accelerate, and more serious entrants into the market will help to normalize electric vehicle adoption. That means more charging infrastructure, more understanding and education, more word of mouth. All of which helps, rather than hurts, those companies which are already working towards the electric future. The Tesla owners at this meetup understand that. As EV fans, we were all excited to see a new car from an established company which really seems to be a serious entrant into the space, and we’re excited that more people will be exposed to electrified transportation as a result. Even if we’ve already made our decision as to what car we want to own next, we’re happy that there will be more choice out there for consumers, and that people will get a chance at the joy we’ve experienced since switching to electric. And the Bolt, which seems better than every non-Tesla entrant yet, will certainly force the rest of the industry to up their game – heck, they’re even giving Tesla the hurry-up, since GM is beating Tesla to market at the ~$30,000 price range. As I like to say whenever brand loyalty arguments crop up in electric car circles: “same team.” We’re all pushing for the future here, no sense in squabbling or badmouthing other brands when this segment is still so young. Tell us what you think about the Bolt in the comments.